“Ohayo gozaimasu. I just found your website and I can’t wait to go through it. I just moved to Sendai, and my family will be following shortly, for a three year work contract. I’ve already found two species growing wild, Dendrobium monilififorme on an island in Matsushima Bay, and Spiranthes sinensis in a weedy lot three blocks from my hotel in Sendai. I’m tuned into spotting Sprianthes since they’re growing as lawn weeds in my yard in Florida. Again, thanks for putting up the site, and I’m looking forward to reading your articles. Do you have a mailing list that updates when articles are published? Welcome to Japan! I’m guessing you are helping sort out the mess after the tsunami (given your new location). I also see you lived in Florida – my old home as well. I lived mostly in Gainesville, but also did stints in Port Charlotte and Miami. Just like Florida, you will find that Japan is home to many orchids. The Spiranthes are as weedy here as they are in Florida. It is cool you got to see Dendrobium moniliforme up in Miyagi – that population is the farthest north it is found naturally these days and represents the farthest north any true epiphytic orchid lives in the world (all thanks to warm water currents from the south plus the huge, warm Pacific Ocean). Thanks. Actually, I’ve been hired as a pilot with a Japanese airline on a three-year contract. We’re from Destin, a lovely place, and we plan to move back when my contract is over. I have a pond in my backyard, so not only do we have Sprianthes, but also Calopogon tuberosus and Pogonia ophioglossoides, as well as the bug eaters Sarracenia flava and a few Droseras. We did have a clump of Habeneria repens bloom one year but I haven’t seen it since. Native orchids have always been my favorite, and I can’t wait to see what I can discover in Hokaido. I’m writing from the Kansai region. I’ve lived in Kyoto for the past three years and I’ll reside here indefinitely. In the States, I was trained as a professional horticulturist, did my own design-build work, loved working at nurseries, and held a two-year+ gig as a taxonomic assistant at the Missouri Botanical Garden. Despite all of that experience, in Kyoto I find my plant identification skills – and all other related skills for that matter – settling somewhere down into the sump of my memory, far beyond recall. I’d like to hear from you about what resources you use for learning and identifying plants here in Japan. Are you using the same references you did in the States? Are you reading dichotomous keys in Nihongo? Are there books or online resources in English focused on Japan’s flora? I’ve searched for all of the above. I do appreciate the Yama-Kei books, though my reading speed is glacial, at best. When I came to Japan 10 years ago I had very little knowledge of Japanese plants whatsoever. I did do a lot of plant hunting back in the states, particularly in the southeast. I took a number of plant ID courses, dendrology, and even paleobotany. While I was trained as a zoologist, worked in a microbiology lab for years, and had a short stint as a high school science teacher, my love has always been plants. That is the reason I am doing this blog, my love of plants. Toward that end, I endeavored from the start of coming to Japan to learn everything I could. Glacial is a funny word to use because my situation was even worse – how to learn when I possessed no language skill at all? Well, it took time. I bought books, talked to people who would bother with me, and used online resources (in Japanese) to decipher, piece by piece, what I was looking at. Luckily, I had a lot of practice from my experiences in the states. Dichotomous keys! Ouch… To my knowledge, finding good information in English about the vast majority of plants treated here is a hopeless task. Many plants are pretty easy to ID – most orchids for instance, while others are not. Ferns for example can be a real mess – I haven’t tried to wade too deeply into that maelstrom, just skirt the edges. The number of look alike species for the common fern Polystichum polyblepharum, for example, is staggering. You literally need to have all the distinguishing characteristics outlined for each species and head off to the woods for perfect IDing. Fortunately, that has never been my interest. I intend only to introduce the reader to what is around based on my own real world experiences. Virtually everything I write about is based on my experiences here, either cultivating or finding whatever plants I deem interesting. That is what I offer on Botany Boy. “Hello and warm October greetings from Mantova, Italy. At any rate, I am thinking about making a shady, ferny garden of Japanese delights in a former cow barn near Mantova, and would love your ideas and maybe help in creating an impressive collection. My garden and blog are here: http://www.galeazzagarden.tumblr.com and the association I run is here: http://www.galeazza.com. We’re still in the process of making the new, post-earthquake website for the new place, Corte Eremo. Thanks for the comments. I heard about that terrible quake and also the unusual summer storms that devastated the gardens of Villa Taranto. I am glad to hear of your plans would be happy to make suggestions. Did you find your fern on my site? I’m afraid most I have written about so far are wild types, many of which are not usually found in western gardens. Best of luck with your gardening endeavors. “Love your website and your youtube videos. I’m in the Navy, although a pacifist and a plant lover. I’ll be going to Sasebo in June on 2013 and looking forward to hiking and learning about the native flaura of Kyushu. If you’re interested in a hiking buddy my girl and I love the outdoors and have plans to do a lot of exploring when we come down to Sasebo. Let me know if you’d like to go hiking next year, I’d love to join you if you have room on your exploration! are very enthusiastic to say the least when it comes to plants. Seems as you are too you might enjoy them. Hope to hear from you! Glad you like the site. Kyushu is full of interesting stuff, but you have to know where to look for the more unusual species. Much of the lower mountains have been completely cut over and in many cases replanted in conifer plantations – Cyrptomeria and Chamaecyparis mostly (~56% of them in Kyushu). They are pretty barren, but there are pockets of nice forest in between. Sure, give me a call when you come. I’m sure we can meet up for a hike or two. Nagasaki Prefecture has some nice places to visit. Tom – Great job with the site! Enjoyed your coniogramme article. We grow and offer a number of these, but have never seen a variegated form of C. japonica. Hopefully a trip to Japan in the near future. If you ever have an interest in trading or sharing spores, let me know. Thanks. I too stumbled onto your Kikuchi Gorge pages and loved them. So much that representing my workplace I designed and led a tour of Canadians to visit there (for a couple of hrs) last November. WOW. and thats not the Fall color I’m referring to. We went up Mt Aso day before and I made a note to come back, Fall of 2014. We (another nursery owners group) want to roam the hills and forests a bit and study the native plants. Also we’ll revisit Yakushima. Outstanding place, have you been? I’m building some good connections there. But yet have none on Kyushu. Would love to try some nursery visits anywhere but precious little info – what say – any tidbits would help, cheers/kanpai desu. I wrote to you a while back, asking if you could help me identify a grass I managed to grow from seeds I got in Japan last year (or the year before, I can’t remember)… at any rate, it was a kind of Carex, but I’m still not sure what kind. I can’t remember if we were in touch before or after the earthquakes, but the news is the castle where I was living near Bologna was destroyed in may of last year, and I have moved to a new place, where I hope to make a mossy, ferny garden inside an abandoned cow barn. It’s coming along slowly. I waould like to add ferns, and I recently learned a place not too far from here sells Japanese ferns. I also wanted to ask you if you would like to take part in a documentary about moving the garden of Galeazza to this new place – and then maybe again to a final destination as yet to be found. I really like your videos, and scribble down all the names in Latin and Japanese as they appear, as I would likek to add as much as I can. Do you think I could get Lygodium japonicum to grow up in the barn? My blog to get an idea of the space is hortushorreidottumblrdotcom. Look forward to getting back in touch! I am a bit confused as I see that my last comment is stuck in the middle of Nov. 2nd 2012 and as you haven’t replied I wonder if you didn’t see it yet? Anyways, that tour I talked about is for members of the Hardy Fern Foundation here in the Pacific Northwest and the British Pteridological society. I am trying to put together an itinerary and it would be fantastic if you could guide us on a couple of hikes, compensated of course! The tour is in 2014 but my husband Kazuo and I will be in Japan this fall; maybe we could meet up in your home town? Been madness here lately. I will email you soon. Tom, I visit your website from time to time. Seems you and I are both permanent residents in the southern part of the main islands. In my case, the Pacific coast of Kii Peninsula, the southernmost part of Honshu. I’m curious about why you haven’t more of the tremendous variety of Japanese broadleaf trees shown on your site. Is it a matter of time and opportunity, or do you have so few in your area? Those sugi and hinoki plantations do tend to blot out the native species. I’m thinking in terms of the magnificent, wind-stout kayaki of the fragrant and valuable wood, the several varieties of hornbeam, the several varieties of live and deciduous oak and oak relatives, especially the Castanopsis cuspidate, or shiinoki, of black mushroom culture, and so on. There are species mulberries, walnuts, hazels, persimmon, beech, and oh, what? hundreds of varieties of maples, just to scratch the surface. Those species and varieties, and many more, are endemic to this mountainous coastal region of Japan, and I should think there would be populations in your area as well. Are those items in the future of your site? Hey Rick, well, what can I say, I am one man writing a website by myself. As you can see from the content I’ve already put up, my interests span a wide range of plants, notably orchids and ferns, but certainly not limited to them. I do enjoy hardwood species, and yes there are a bewildering array of them down here on Kyushu. I’ll get to more of them eventually. It is just a matter of time… But next week I’m off to Sichuan to see the fields of Cypripediums there and I imagine the site’s content will lean in that direction for the coming months! Let me know if I can help with illustrative photos or other contributions. I haven’t training or expertise, but interest. Typo error in spelling of keyaki, in my last, by the way. No doubt you saw that. And cuspitata. It seems that the spellcheck is autocorrecting instead of allowing me to move on with a word it doesn’t recognize. Bummer. Where do you grow all these plants? You garden must be quite large …. 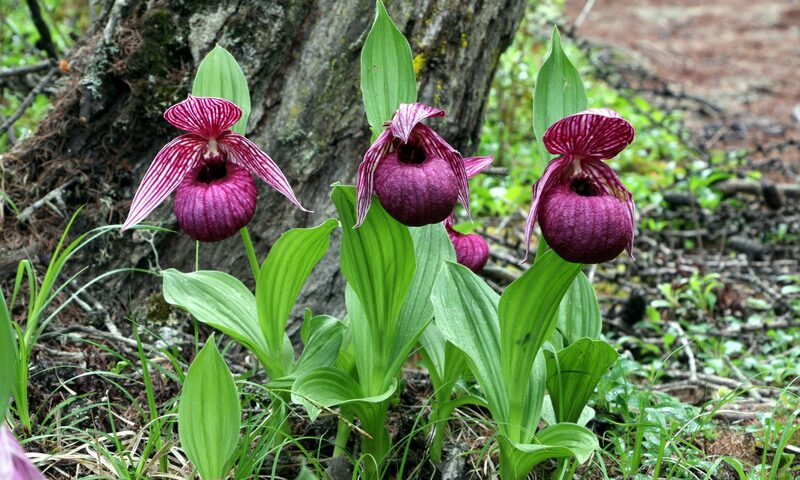 I was wondeirng whether it would be possible to use bonsai soil for growing Cypropediu of the Cypripedium debile group …. The other question is wher ewe could buy japanese ferns in Europe. See my response on the C. debile page. I was in China, hence the late reply. Great to hear from a fellow nature lover in the local area. We should meet sometime. I’ve sent you an email. Thanks for your interesting articles. Would you mind emailing me? I have a question relating to a book. Love your site – it’s one of my go-to sites for unusual plant ID and to dream away a rainy afternoon. I hope you will offer Spiranthes sinensis seed in your new store 🙂 I’ve got native white Spiranthes growing all over my woodland garden – it happily started spreading once I cleared away the runaway stilt grass trying to choke out all the mini-plants. Man oh man would I love to add some pink sinensis to my garden! A PINK sinesis! Wow. I’m glad you are enjoying the site. Don’t forget to check out my Youtube channel as well since it mirrors the site closely. As for offering Spiranthes sinensis (or any other orchid), the jury’s out on that one right now. Ah, the complexities of satisfying governments! I think your climate should be perfect for growing this species, or virtually any other evergreen tree from Japan/southern Asia. I’d grow them in a fairly rich loam with constant moisture. They are found on semi-dry slopes, so should have a bit of drought tolerance, but I wouldn’t push that too much. Other than that, I’d guess this is a pretty easy one to grow. As with other acorn type seeds, plant them while fresh for best germination. This is a pretty common street tree here in southern Japan. Rebecca and I have been thinking about you today. Love the website and the videos. Wish we could come see you. Send me an email and let’s connect. Well, it has been a while – around 12 years if memory serves. I’ll send you a mail soon. A lot has changed in life since we last met. You have a very impressive site. Currently, I am enjoying your videos on Youtube. The one on variation in Cypripedium tibeticum will be given to my students in Pollination Biology (BL-404; Saint Louis University) when we reach the lectures on color variation within the same species. Meanwhile, the following link will take you to an upcoming book that may be of professional interest. I’ve enjoyed your website since I first discovered it a number of years ago researching Fuukiran. My wife and I plan to travel to Japan in mid February for about two weeks coinciding with the Tokyo Orchid Grand Prix. We were thinking about visiting Ranyuen nursery in Chiba, sites in Kyoto, and Himeji Castle as part of our trip. Can you recommend any other gardens or cultural sites that are a “must see” for that time of year? “shaped by the shear artistry of Japan’s horticulturalists. Did you mean “sheer artistry”? Thanks for the input. Writing and editing a blog entirely on my own means that lots of stuff passes me by – not much of an excuse I suppose, but in my case inevitable. I’m sure that if you comb through the entire site you’ll find all kinds of errors. Truth is I don’t have time to go back and edit it all (though I admit a typo on the lead page is embarrassing). Tom Just came across your website the other day while researching for a newspaper essay on hinoki. Love your text, photos and videos. I’m also from the eastern US — Brooklyn and later West Milford in the NY NJ Highlands. Been living here in Japan for nearly 40 years. I teach Anthropology and Environmental Resource Theory at a small Japanese University. My formal education is in Anthro and Folklore but I study plants and animals on my own and have been writing a weekly naturalist essay (Nature in Short-every Tuesday) for the Japan News (formerly the Daily Yomiuri) for about 20 years. I live in Chiba, on the outskirts of Tokyo but my two children are in Fukuoka so I visit there often. Chiba is still within the range of the broad-leaved deciduous forest zone. The camphor trees grow big here when planted but do not germinate on their own. The kings of the forest here are the chinquapins (Castanopis) and live oaks, with an occasional Machilus or momi fir. The only place we see immense camphors, or any really big trees for that matter, are in the sacred groves at the local shrines. I have some stuff I’d like to send you if you don’t mind giving me your physical address. Thanks Kevin for your interest in BB. I sent you an email. I’m currently planning a trip to Japan, and in my research came across your site. Its a great site, and has a wealth of information. Since you seem to be such a great resource, I wondered if you might be able to answer a couple questions. Do you know of any English field guide for Japanese trees? I have downloaded a pdf of the Ohwi “Flora of Japan” and also saw that this is currently being updated, but the volumes are extravagantly priced. My primary interests are in rare plants and old growth. Because my visit will only be 2 – 3 weeks, I figured I’d focus on trees. Do you have any suggestions on tree identification that would be simpler than printing out the full flora? My second question regards old growth, which seems to be more commonly referred to as primeval for Japan. I have researched several sites, but was wondering if you know of a good resource for this. Specifically, I am thinking of visiting Fukui, Fukuoka, Ehime, and possibly Hokkaido and/or Yakushima. I have looked up Tachibana and Koshosan in Fukuoka, but would be interested in any other recommendations you might have. Greetings Darian. I’ll email you once I get a little time. In short though, I haven’t found any good English versions of Japanese field guides, so I rely on Japanese books and internet sources. The “flora of Japan” is as useful a source as you’ll find in English I think. Knowing the Japanese names is helpful so you can then do searches online and get a wealth of information that doesn’t exist on the English side of the web. Old growth in Japan is very limited, usually just around temples and shrines. Parts of Yakushima and some other islands in the south like Amami Oshima are perhaps the last places you’ll see forests that are close to what was historically here. Kyushu as a rule is cut over and much has been converted to conifer plantation. I’ve heard that some areas in the interior mountains of Miyazaki Prefecture offer some of the best forest left on Kyushu, but I haven’t traveled there and it would take time to find the good parts. Isolated examples of old growth tend to be very limited in size, sometimes just a handful of acres. Thanks for your wonderful fern videos. The possibility of acquiring properly id’d fern spores with origin site data would be fabulous. Please email if this might be possible. Thanks. Thanks Ian. Yes, it was a lot of work, but fortunately a labor of love. Thank you for posting the blog articles and videos! I recently moved to Minoh-shi (Osaka) and am learning the local fauna. Your site is a treasure trove of information and is really helpful. I am the head of the Osaka International School of Kwansei Gakuin. If you are ever in the area, we would love to have you come to our school! I would like to have your expertise in identifying local trees and plants in the area. Thanks again and please, keep posting videos! Bill, great to hear you are enjoying the site. If I’m ever up your way, I’ll definitely look you up! Of course if you’re ever down this way, please look me up too. Pardon, but you are from Serbia? I haven’t had a chance to give your site a good look yet, but I’d definitely be visiting it more very soon. The first spring video should be up within a few weeks, and hopefully another in a month or two. Larry, that guy has some delicious video. Japan is pretty from the air! Is this the site I should use to ask for directions on how to start seeds of the Habenaria Radiata? Growing any orchid seed is a little tricky, and terrestrial orchids can be even more challenging. You have to decide if you want to try to naturally germinate them, or to do it under aseptic conditions. Since this is a complex topic, I recommend you check out this webpage from the Hardy Orchid Society: http://www.hardyorchidsociety.org.uk/HOS%201012/Cultivation.html. In their newsletters (downloadable pdf files) you can see the different ways in which terrestrial orchid seed can be grown. Good luck! Are there any nurseries in China that specialize in Neofinetia Falcata that are english friendly? Kind regards! The only nursery I know in China that specialize in orchids and sell outside of the country legally is Hengduan Mountains Biotechnology. You can see my blog post about this nursery. I don’t know if they ever deal in Neofinetia, but they may on occasion. I have been residing in Osaka for 5 years with my family and have become very interested in bonsai. This year I plan to start my journey with Fukiran and dendrobium plants. I was wondering if you had time, you could steer in me in the right direction with a few things. Also when is the best time to repot dendrobium. I have a small one now and it lives outside all year round. Ohh one last thing, you’re super cool! I like to repot both Dendrobium moniliforme (Japanese name sekkoku) and Neofinetia falcata in March, just before they start to grow. If you repot in the middle of growth you will damage growing roots – not a death sentence, but not the best idea either. You can pot them into pure, high quality sphagnum moss, or you can mount them to wood as well. I grow many attached to a small plum tree in my side yard and they do fine, even in the snow. You can do this in Osaka as well. Thanks for the compliment 🙂 If you haven’t seen my Youtube channel yet, please check it out! invaluable in writing my own blog posts about ferning in Japan. As you say so little information in English. Thanks for all the good work and putting it out on the web for us. I downloaded a video from you tube. I watch it daily. It’s wonderful. Wow! Rose’s variety. I’m impressed realy. I wish to god that you get which you want. And requested to all people please watch once this video. I was fascinated by your video of wild C. goeringii, also the one showing your epiphytes in the snow! I have a question about Japanese orchid culture. I keep seeing examples of the Neofinettia potting technique in a hollow moss ball and would like to know if Japanese growers generally pot other types of orchid in the same way. It looks like it could work well with anything that does not grow more than about twice as high as it is wide. I am tempted to try it with Angraecums, short growing dendrobiums (particularly some of the Papua New Guinea cold growing ones), Holcoglossum, Masdevallias, Restrepias and maybe one or two others. I am very much interested in revoluta v. alba and v. variegata after reading your article. As happen to have a holiday trip to okinawa in this coming Feb., can you advise where in okinawa I can purchase these plants ? Any seller or shop ? Thank you in advance for your informative replies. I’m sorry, I don’t know of any nurseries in Okinawa, though I’m sure they exist. The plants you seek are most commonly sold over internet auctions like yahoo or rakuten. Many growers are small and have little or no internet presence. For example, last winter I was in Amami Oshima just north of Okinawa and happened upon a wonderful little nursery full of C. revoluta (unfortunately closed). It was a man’s house with a garden attached. If you look on google maps you can’t even see him listed. I think that situation is typical.